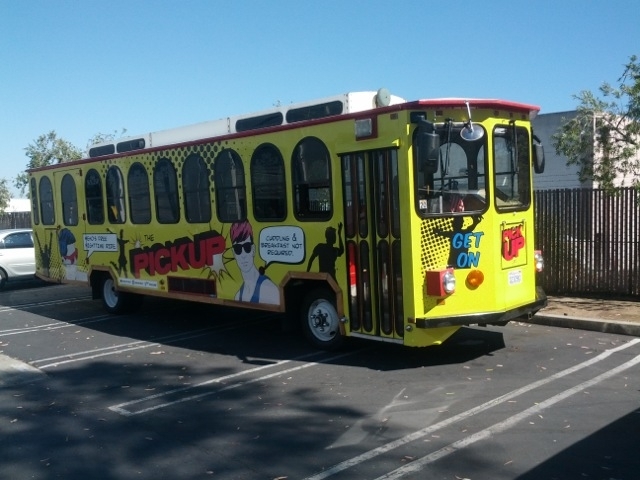 The PickUp Line, the new entertainment shuttle of WeHo. Photo: City of West Hollywood. Starting tonight, West Hollywood will run a free nighttime trolley service known as The PickUp Line. On Friday and Saturday nights, this entertainment shuttle will carry passengers safely down Santa Monica Blvd from 8 p.m. to 3 a.m. This program will start August 9 and will run until December 28. The PickUp will make 15-minute runs from Doheny Drive to Fairfax Avenue with a detour to the West Hollywood Public Library parking deck on San Vicente Boulevard. The vehicles have 20 stops along circular route with 10 east bound stop locations and 10 west bound stop locations, all of which are existing Metro bus stops. To find a stop, look for the brightly colored yellow signs out on Santa Monica Blvd or you can find a route map at the official website. I thought Trolleys were defined as rail, not rubber tires on pavement? Or perhaps, we have expanded the definition in an attempt to make a bus more appealing? THAT is NOT a trolley. It’s a bus, and the novelty coachwork doesn’t make it anything but a bus. A TROLLEY is an ELECTRIC street or interurban car, or an ELECTRIC bus, that is POWERED BY AN OVERHEAD WIRE (or pair of overhead wires, in the case of a trolley bus). If it’s electrified under overhead, and isn’t a class 1 railroad, then it’s a trolley. If it’s not electric, or it doesn’t run under overhead, then it’s NOT a trolley. when people think of trolleys they usually think of the small little cars that move very slow. I still find it weird that SD’s system is the Trolley. It’s kinda outdated. I prefer Light Rail. This could be the first leg of a “Trolley” from West Hollywood to LACMA with stops at the Grove and the Beverly Center. This is a fantastic and much-needed program offered for FREE, and the only comments I see are people discussing the use of the word, “trolley”? There are WAY too many drunk people driving home from the bars with one eye closed in an attempt to curb their double vision. THANK YOU WeHo city council! I absolutely love this and will definitely be on board. I don’t think this program will work because the Yellow Trolleys just look cheap and not high tech. A better idea would been to use old 35 foot TMC buses painted dark blue or black. Then the clientele would have a large limo looking vehicle dropping them off.